Total resistance is made up of two components-grade resistance and rolling resistance. The greater the resistance, the more power required to move the load, the higher the costs of fuel, tires and undercarriage components. You can use rolling resistance factors to help you identify which equipment will be most efficient on your worksite. Rolling Resistance is a measure of the force that must be overcome to roll or pull a wheel/track over the ground. It is affected most by ground conditions and load—the deeper the wheel/track sinks into the ground, the higher the rolling resistance. Internal friction and tire flexing also add to rolling resistance. A 2 percent base resistance is quite often used for estimating, however the more accurate your description of ground conditions and load, the more accurate your estimate will be. 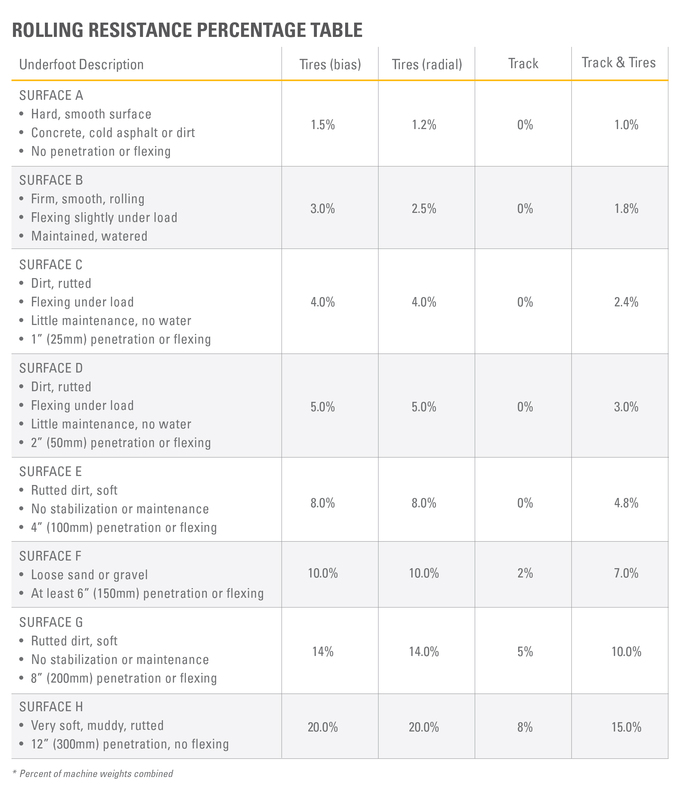 Find the underfoot description below that best describes your worksite to see the resistance factors you can use for estimating. Consult your Cat® dealer for more information.